$10.50 per hour for workers at businesses with 26 or more employees. $10.00 per hour for workers at small businesses (25 or fewer employees). Most California workers must be paid at least the minimum wage. * If you are paid by piece rate, per hour, by commission, or paid by the day, your wages still have to equal at least minimum wage for each hour you worked. Tips are separate and cannot be counted as wages. Some cities and counties in California have a local minimum wage that is higher than the California rates shown above. Check with your local government agencies for more information. *There are a few specific exceptions to this law which exempt outside salespersons, individuals who are the parent, spouse, or child of the employer, and certain apprentices. Additional information on minimum wage laws is available on the Labor Commissioner's website. However, overtime laws do not apply to all workers. Certain workers, such as domestic workers and farm workers, are covered by different overtime laws. If you have a collective bargaining agreement with your employer, your overtime rate may be governed by that agreement. You can read more about overtime laws on the Labor Commissioner's website. An overtime pay schedule went into effect January 1, 2019 for agricultural workers. 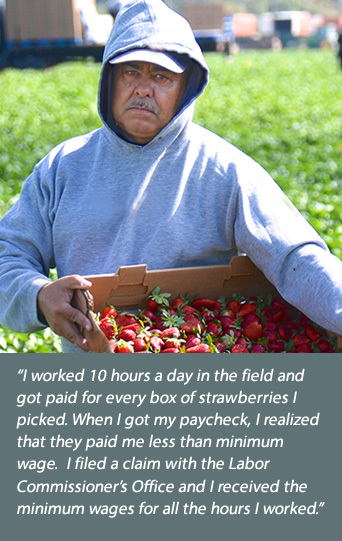 For the first year of the phase-in agricultural workers at large businesses will earn overtime pay for all hours worked over 9.5 hours in a day or over 55 hours in a workweek. Small employers will have an additional three years before the changes to daily and weekly overtime pay take effect. You can read more about agriculture overtime laws on the Labor Commissioner's website. An uninterrupted 30-minute unpaid meal break when working more than five hours in a day. An additional 30-minute unpaid meal break when working more than 12 hours in a day. A paid 10-minute rest period for every four hours worked. Certain workers, such as domestic workers and farm workers, are covered by different meal and rest break laws. Additional information on meal periods and rest periods can be found on the Labor Commissioner's website. Your employer must pay you the wages promised whether the promise was oral or made in writing. 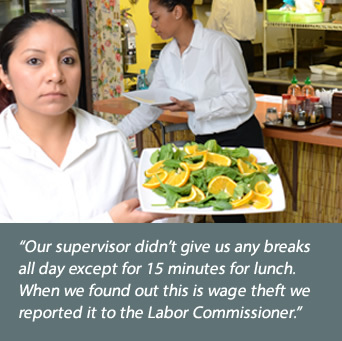 The Labor Commissioner enforces all wages an employer owes, not just minimum wage. For example, if your employer promised to pay you $15 per hour and only paid you $10 per hour, you may file a wage claim for the unpaid amount of $5 per hour. "Public works" are projects that are paid for entirely or partially out of public funds. Public works projects can be construction, alteration, demolition or repair work done under a contract with public funding. Workers on public works projects are paid the "prevailing wage", which is a predetermined hourly wage higher than the State's minimum wage. Prevailing wage is paid on public works projects to workers including those hired by subcontractors, independent contractors, and anyone else who performs skilled or unskilled labor on the project. For more information, you can learn how to file a public works complaint. Most workers are entitled to paid sick leave, earning one hour of paid leave for every 30 hours worked. The sick leave that employers are required to provide is capped at 24 hours or three days per year. To qualify for sick leave, a worker must work for the employer for at least 30 days within a year and complete a 90-day employment period before taking any sick leave. An employer may satisfy its obligation to provide sick leave by providing employees 24 hours or three days of sick leave at the beginning of each year. Employers can decide to provide more generous leave. 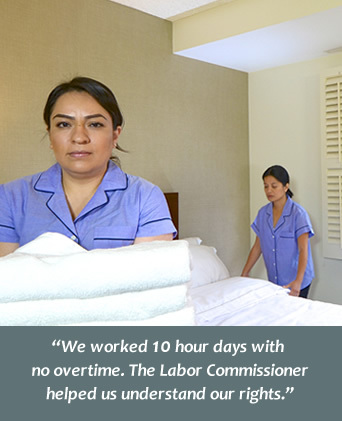 Learn more about paid sick leave on the Labor Commissioner's website. Your employer must inform you of how much you will be paid and when you will be paid. When you are hired and before you begin work, your new employer must provide you a notice that details your rate of pay. Employers are also required to post a notice that lists the day, time and location of payment for the regular payday. Additional information on paydays and pay periods is available on the Labor Commissioner's website. Employers must provide a pay stub or wage statement that details the total hours worked, pay period dates, wages earned, deductions, and your employer's name and address. If you are paid on a piece rate basis, the stub must also include the number of pieces completed and the applicable piece rate(s). If your paycheck is returned for insufficient funds, you may file a wage claim against your employer for penalties of up to 30 days' wages in addition to the amount of the check. Except for withholdings required by law (such as social security tax), your employer may not withhold or deduct wages from your pay. Common violations include deductions for uniforms or tools. Additional information on allowable deductions is available on the Labor Commissioner's website. You must receive reimbursement for supplies and tools needed for the job. This includes the cost of mileage if you are required to use your personal car for work (other than commuting to and from your job). However, if you earn at least twice the minimum wage, your employer can require you to provide certain hand tools customarily used in your occupation. If you report to work expecting to work your usual schedule, but receive less than half of your usual hours, you must still be paid for at least half of your usual hours (for a minimum of at least two hours). For example, a worker who reports to work for an eight-hour shift and only works for one hour must receive four hours of pay, one for the hour worked and three as reporting time pay so that the worker receives pay for at least half of the expected eight-hour shift. Additional information on reporting time pay can be found on the Labor Commissioner's website. If your employer fires you or you quit with at least three days of notice, you must be given your final paycheck on your last day of work. If you quit without notice, your employer must give you your final paycheck within 72 hours. If you are not paid on your last day, or within 72 hours if you quit without notice, you may file a wage claim for waiting time penalties that include an additional payment for each day that your employer withholds your final paycheck for up to 30 days. Additional information on the waiting time penalty is available on the Labor Commissioner's website. It is illegal for employers to retaliate against workers. This means your boss cannot punish or fire you or your co-workers for taking steps to enforce your labor rights, such as reporting a labor law violation or a workplace safety hazard. If you file a wage claim or cooperate in an investigation and you were fired as a result, this may be retaliation. Be sure to report any retaliation to the Labor Commissioner's Office within six months of when it happened. In some cases, the Labor Commissioner's Office can help you get back any lost wages, as well as other payments and your job. Additional information on retaliation and discrimination can be found on the Labor Commissioner's website. Learn how to file a retaliation complaint.